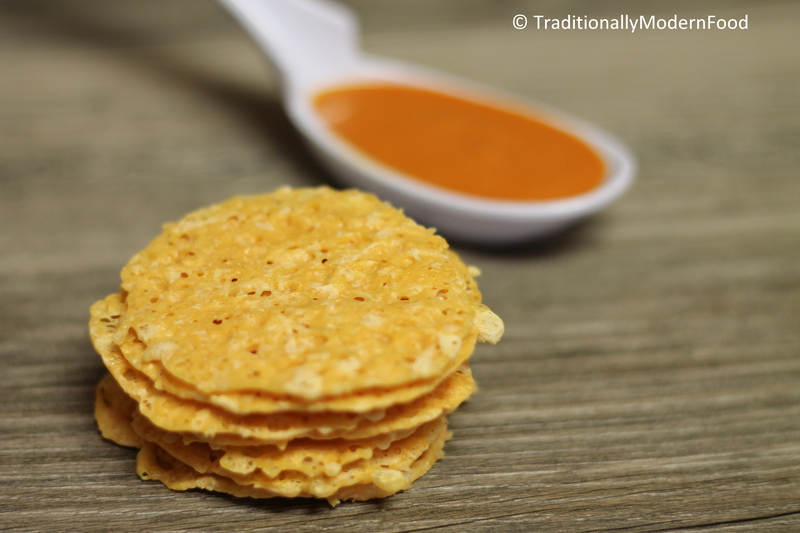 Many a time we feel like having a quick snack without much work, and these cheese crackers are perfect for such days. 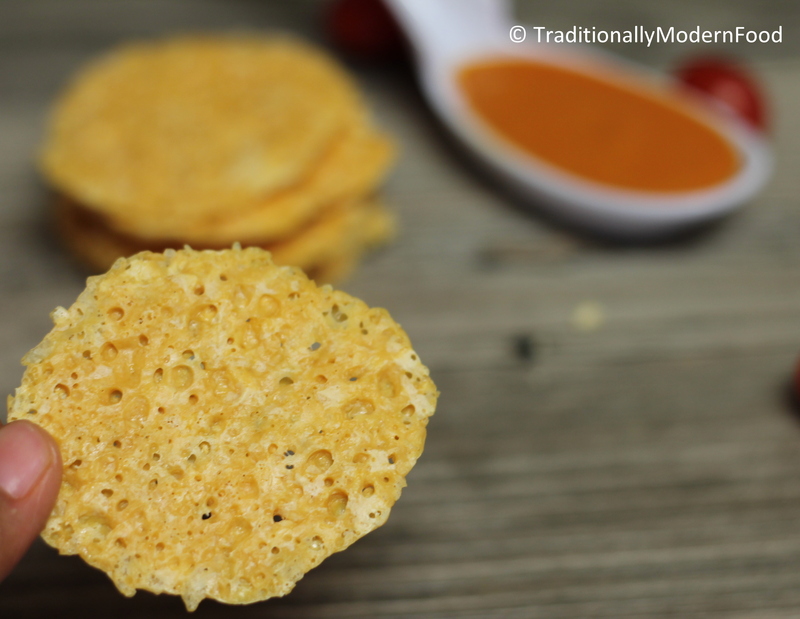 With just one ingredient, this is not only a yummy snack but also a great side for tasty soup. Yes that is how I introduced this cracker to my husband. Now a days when I see cheese in my fridge, my heart starts melting for these lacy cheesy treats. Back in Bentonville, I was watching Barefoot Contessa in food network channel, and Ina Garten was doing a cheese special show. Oh man being a big time cheese lover I was drooling while watching the show. I couldn’t stop thinking about the cheese crackers she prepared with Parmesan cheese. Certain dishes can’t be postponed, this is one such dish. If you are a cheese lover halt reading, check your fridge for sharp cheese 🙂 That day I checked my fridge and I didn’t have cheese. Luckily it was Friday, grocery shopping day. First thing picked from the shop was sharp cheddar. As I told in my Roasted Tomato Soup, we had these crackers with it. I was in big dilemma which one to bake first veggies for soup or cheese Chips. My snack addiction tempted me to bake the crackers first. As soon as I saw cheese bubbling I was waiting to pull out. Light salty, crispy, crunchy crackers disappeared in no time. I gave one to my kiddo, he said Chips nalla irukka (Chips taste good) and asked for more. Immediately my hubby and I became so happy. Every time we go to see pediatrician we hear the same sentence. Give him more protein. Other than lentils, milk, curd – cheese is my saver. Gone are those days when he used to eat string cheese holding them himself. Other than his favorite Mac and cheese, this is yet another tasty one in his favorite Chips form. Preheat the oven to 350 degree Fahrenheit and grease the baking tray/cookie tray with parchment paper. Bake it for 5-7 minutes until it forms a lacy circle slightly brown. woow!!!! i just needed that! Looks like a perfect, express snack! Super quick snacks are always huge time savers. These crackers look crispy and delicious. Love those crackers Vidya, I have to make them. This looks wonderful. I’ve got soup plans later in the week and these will make the perfect finishing touch. There is a hamburger joint here that has lines out the door. Their burgers are nothing to write home about BUT the crisp cheddar on top is what draws people in – same idea, done on a griddle. Yum! I love that you outlined the different methods for this little snack. I’d love to experiment with herbs and spices on these! I too love barefoot contessa shows. These crackers look so addictive!! And also a quickie to make! ! Wow! Thats a damn easy and addictive snack!! Super awesome quick recipe…will try for sure! !